Egypt's anti-blasphemy law: Defence of religion or tool for persecution? 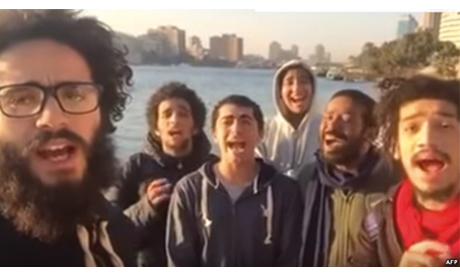 Members of the satirical performance art troupe Atfal El-Shawaree (Street Children) posted a video online that some deemed "blasphemous," calling on authorities to charge them under a law that critics say is often misused to violate the right to freedom of expression. "Religion has its sanctity, the video posted by this group undoubtedly defamed Islam," Ahmed Kereima, a scholar of Islamic Sharia, said in a phone interview with TV host Ahmed Moussa on Saturday. "Therefore I immediately call on the top prosecutor to charge them with defaming Islam." On Sunday, Alexandria prosecutors started looking into a complaint filed by a lawyer in Egypt's second biggest city against the group for "insulting religion." In May, the troupe posted a video mimicking the speech of anchors on the state-owned religious Al-Quran Al-Karim (The Holy Quran) radio station. Egypt's anti-blasphemy law – Article 98 (f) of the penal code – has been used recently to target several people in high-profile cases, including four Christian students who were sentenced to five years; renowned writer Fatma Naaout who was sentenced to three years; and TV presenter Islam El-Beheiry who was sentenced to one year. Naout was sentenced to three years in jail for saying on her Facebook page that the Eid Al-Adha tradition of slaughtering sheep was the "greatest massacre committed by human beings." El-Beheiry is currently serving a one-year sentence in prison after he stirred controversy by questioning the credibility of some sources of the Prophet Muhammad's sayings, a prime source of Islamic jurisprudence. In February, four Christian minors were sentenced to five years in jail after making a video mocking members of the Islamic State group beheading an individual after the militants finished Islamic prayers. "My child lost confidence in us and lost interest in life when he stayed in detention with criminals for 60 days pending investigations," says the parent of one of the students. Many in Egypt – a conservative and deeply religious country where the predominant Sunni Muslim majority constitutes 88 percent of the population – consider religion a "red line" that should not be crossed, at least publicly, not even by state officials. This "red line" was put in place by legislators in 1981 – during the El-Zawya El-Hamra religious strife – when the Egyptian penal code was amended to prohibit the "insulting of religions." The law was enacted at the time to protect the rights of religious minorities. However, some lawyers and religious researchers believe that the law is now being abused. Although the Egyptian constitution –passed in 2014 in a majority referendum – protects freedom of thought, belief and expression, many of the country's clerics, officials and religion institutions are against the questioning of established, mainstream religious beliefs. The penal code has three articles that criminalise acts that can broadly be defined as blasphemous; articles 160, 161 and 98 (f). According to the Egyptian Initiative for Personal Rights (EIPR), these so-called "blasphemy" cases have been on the rise since 2012, when Islamist president Mohamed Morsi took office. “EIPR has recorded in 2015 nine cases in which the court has issued verdicts against 11 defendants,” the head of the religious freedoms desk at EIPR, Ishak Ibrahim, told Ahram Online. "Not all the cases are against Christians," says Ibrahim. "Yes, we have Christians, but we also have non-believers as well as Shia and Sunni Muslim defendants." The researcher explains that there are three scenarios where contempt of religion charges can be filed. "The first is having a lawyer file a lawsuit, [as was the case with] public figures such as singer Hakim, TV host Ibrahim Eissa, actor Adel Imam, and many others," says Ibrahim. The second scenario, according to Ibrahim, involves a private citizen filing a report against an individual for “insulting religion” during a private conversation or in a non-public setting. "The third scenario involves a case being filed by the state itself, as was the case in the lawsuit filed against satirist Bassem Youssef during Morsi's presidency." The researcher says that although articles 160, 161 are clear and specific, Article 98 (f) is vague. "These two articles [160, 161]... penalise defendants who attack places of worship, deface a religious book, mock religious rituals, and this makes sense," says Ibrahim. However, prosecutors often use the more vague Article 98 (f) to target defendants and refer them to court, Ibrahim says. "Most people are being convicted under the 98 (f) law, this is an unclear article," says Ibrahim. Following the increasing number of cases where defendants are being charged under 98 (f), many are criticizing this law and even questioning its constitutionality. Amna Nosseir, an MP and an Al-Azhar scholar, told Ahram Online that she has taken steps in the House of Representatives to amend this article. "I have suggested this week a draft law amending some provisions of Law 58 of 1937, by deleting the text of paragraph (f) of Article 98, as it contradicts the philosophy and the provisions of the Egyptian constitution," says Nosseir. The Al-Azhar professor of religion and philosophy believes that the term "contempt of religion" is unclear and seemingly limitless. "The four kids [who created the anti-Islamic State video] did not invent a scene from their minds, they satirised reality," Iman Aziz, a mother of one of the four Christian students who were sentenced to five years in jail, said in a TV interview. "I call on President Abdel-Fattah El-Sisi to save these kids, as they have done nothing [wrong]." Ibrahim explains that most of the "contempt of religion" cases are referred to court under 98 (f) because there is no exact definition of "contempt of religion". "What are the standards upon which we decide what is considered insulting religions? Unfortunately, we have no such [standard]," says Ibrahim. He explains that these standards are usually left to the judge overseeing the case, who is often conservative and puts himself in the position of defending religion, therefore most defendants in these cases are convicted. "Not a single defendant charged with contempt of religion in 2015 was acquitted," says Ibrahim. MP Nosseir highlighted that she has been working to collect signatures in parliament supporting the elimination of this article from the penal code. However, Al-Azhar cleric Yehia Ismail strongly objects to the idea of eliminating any anti-blasphemy laws. "How can we tolerate any assault on religions?" Isamil told Ahram Online when asked about the draft law calling for the elimination of Article 98 (f). The cleric argues that religion is the most important thing that defines the values of any human being. "When someone defames a religion, that means that they are degrading your religion, your value, and thus your person," Ismail said. The Al-Azhar cleric further explained that the main aim of these articles is not only to enforce respect for religions but also to protect societies from religious strife. "When we delete articles that criminalise any kind of demeaning of religion, this will result in us living in a barbarous society," claims Ismail. There 2 types of crimes: crimes against Allah, and crimes against people. The Quran has no worldly punishment for blasphemy, because it is not a crime against humanity. In fact, it tells us that if we encounter company that is blaspheming we should walk away till they move to another subject. As such, there should be no human laws and punishment for blasphemy. It is a crime against Allah, and only He decides whether to forgive or punish. Egypt managed very well pre-1981 before this law which has become a tool for revenge, puritanism and fame-seeking was enacted. It is reaching the point that any comment that someone else interprets a comment as anti-religious that was not intended to be, another person's life can be harmed. This law gives the "religious" judges and Imams too much power they were never intended to have. There are many other laws that preserve morality that are reasonable. However, this is not one of them. For abusing your "freedom of expression" by pushing the envelope to test how far you can get. Then you have earned your incarceration, be a man/woman and do your time without whining about it. No one cares about each and every marginally educated loud mouth that has anger management issues.